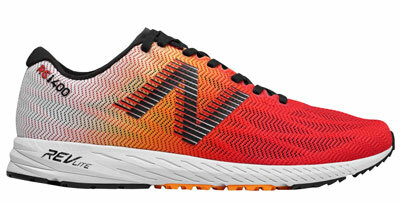 New Balance’s marketing pitch: Designed for a movement that feels fast and race-ready. Upper: Air mesh, internal layering. 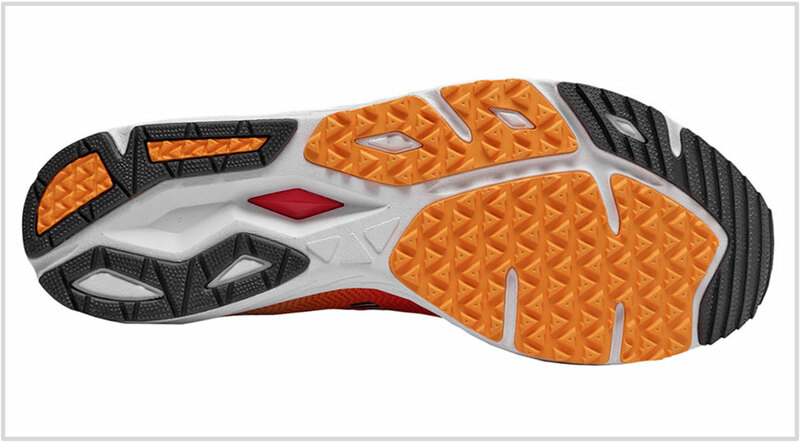 Midsole: Single-density Revlite foam, plastic micro-shank. 10 mm gradient. There are certain shoe models which best represent their category. For example, if solereview were to pick a daily neutral trainer – and it had to be just one shoe, the Nike Pegasus 35 would be it. Likewise, the adidas Boston is the quintessential lightweight trainer and the Brooks Adrenaline 18 is a great mild-stability shoe. And so on. 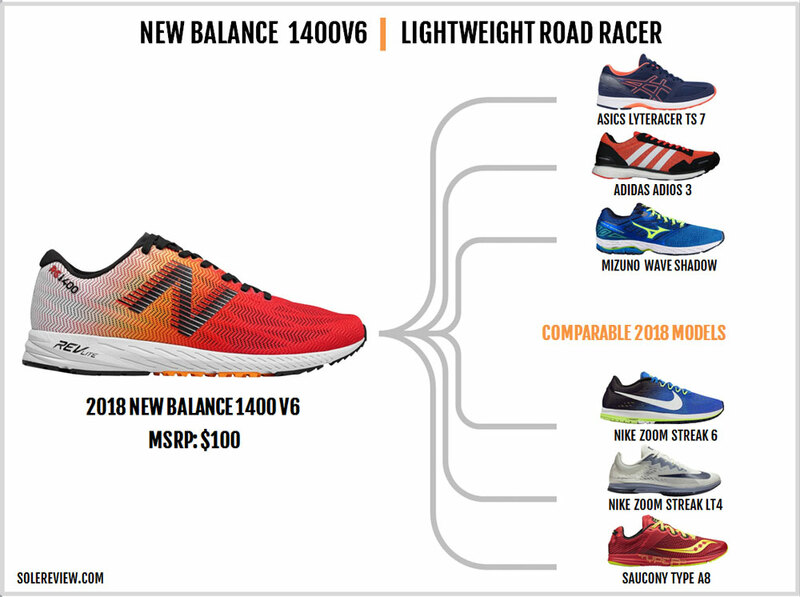 The New Balance 1400V6 best embodies its sub-class; it’s a lightweight and versatile road racer which retails at a relatively affordable price. While its speedy ride quality shines in 10K races or training runs, the midsole has enough cushioning for races of up to a half marathon. And just being versatile doesn’t cut it; the 1400 goes above and beyond. Mated with the low-profile midsole is an upper with an excellent fit, despite the shortcoming of being available in only a single width. For those of you who already have the V5, the 2018 version will feel very familiar. Which makes complete sense as nothing has changed below the upper. All the updates happen on the upper, the kind which helps the V6 lose 0.5 ounces of weight. 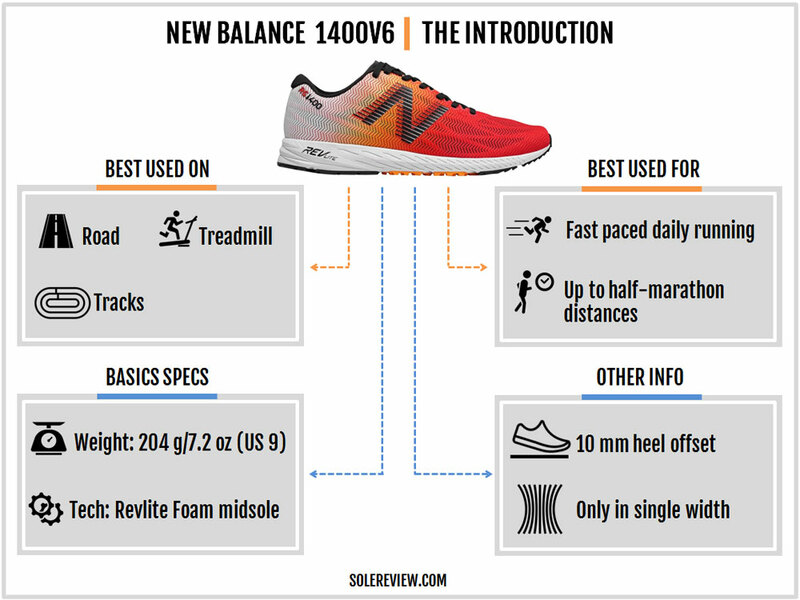 We’ve often remarked that New Balance’s Revlite midsole foam is superior to Fresh Foam, and the 1400 validates that opinion. Revlite comes into its own especially when deployed on low-profile silhouettes such as the 1500 and the 1400. Though the Revlite is EVA foam and isn’t some hi-tech synthetic rubber or Polyurethane-based compound, its formulation is the perfect blend of cushioning and tempo run-friendly road manners. In the absence of a signature foam platform (the underwhelming Fresh Foam and rehashed N2 does not count), Revlite is New Balance’s current tour de force. The sole design is carried forward from the 1400V5, so the V6 retains its supportive and neutral ride character. The compression-molded foam is inherently stable, and additional features like the midfoot shank give it the desired torsional rigidity. The sidewall design ensures that the 1400 has a very neutral character with balanced midsole compression on both sides. The midsole’s single-density construction results in a ride experience which is smooth, connected, and fast. There’s another thing to like about the 1400. The midsole has a heel to toe gradient (the difference between the heel and forefoot thickness) of 10 mm and this makes it versatile for most runners. Not everyone loves running in a 4 mm drop shoe, so a 10 mm gradient offers an easier transition for those who are currently using daily trainers with higher heel offsets. Other standard-bearers of this category like the adidas adios are proof that a higher heel offset works just fine. 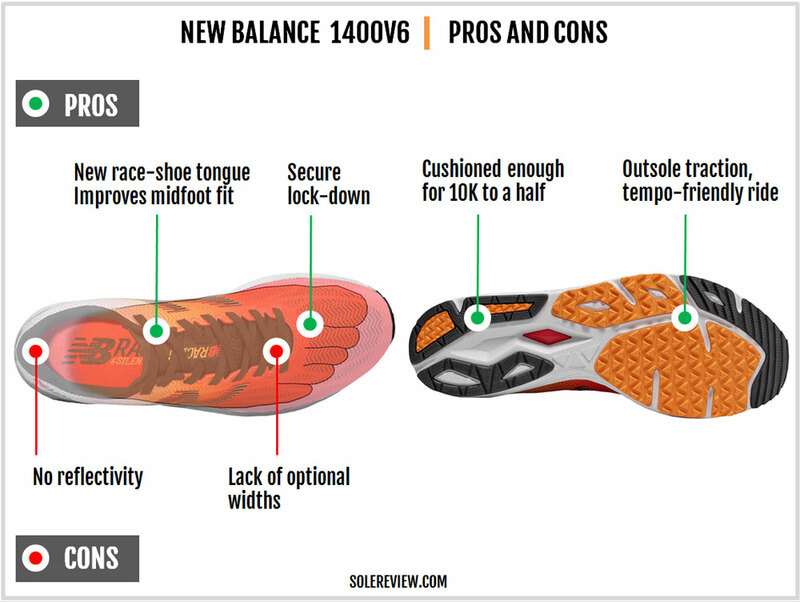 And during runs, the 10 mm drop stays the same more or less as the cushioning is a firm kind. The 1400V6 delivers the said cushioning without feeling like a block of wood. This is what Revlite does best in the 1400 and the 1500 – acting as a padding agent with a loss in efficiency. The underside of the rearfoot has a cavity along with a split crash pad so there’s a bit of compression happening during foot-strike. There’s also the insole which serves as an additional cushioning layer. Using the word soft for the 1400 is a bit of a stretch, and the same applies to responsiveness. There’s a slight amount of rebound (from the heel cavity and the insole) from the midsole which keeps things lively, but that’s all there is to it. 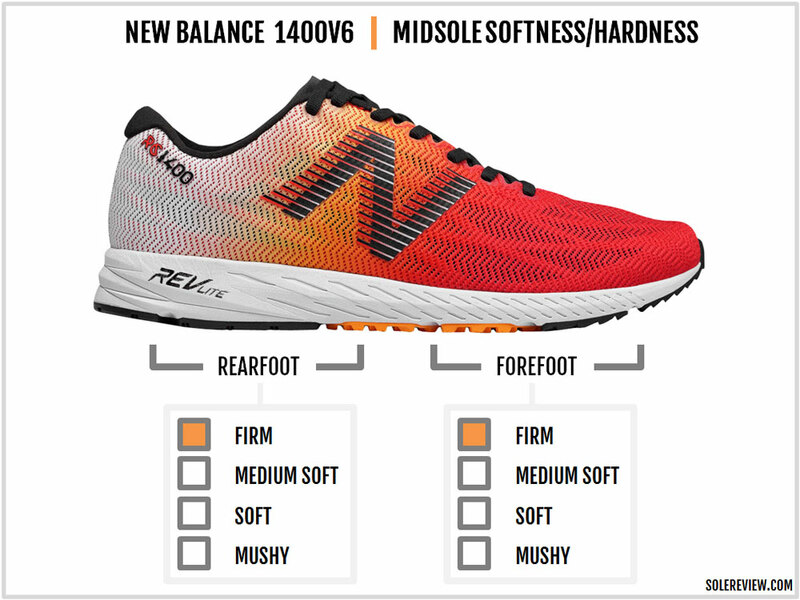 When combined with other factors like the 7.2-ounce weight and a form-fitting upper, the firm cushioning makes the 1400 great for faster (7 min/mile or 5 min/km or greater) paces. Nobody’s stopping you from going for relaxed speeds, but the 1400 feels at home when its Revlite wholesomeness is matched with tempo runs. The blown rubber forefoot outsole grips exceptionally well and helps achieve snappy transitions to the toe-off stage. The outsole layout covers the entirety of weight bearing path with no midfoot gaps. This particular geometry smooths the quality of transitions, helping the foot move quickly along the length of the shoe without awkward breaks. Given the low midsole volume, we recommend that the 1400 be reserved for distances of up to a half marathon; a 5K or 10k is ideal. Over marathon distances, the 1400 will be found wanting in ride comfort. 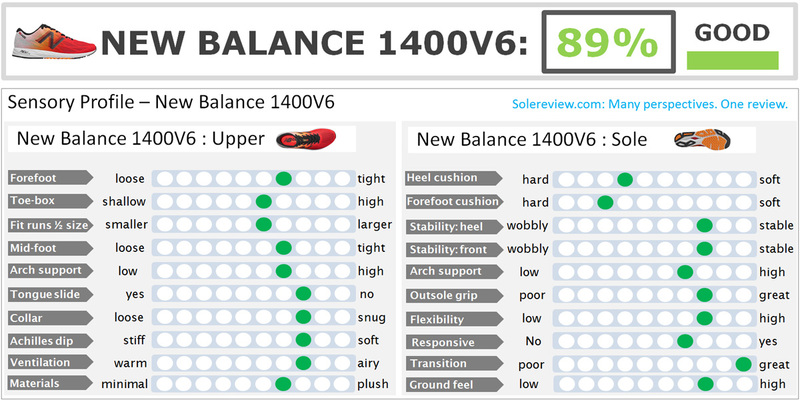 If you’re interested in knowing more about the changes between the 1400V5 and the V6, this section is for you. Nothing has changed as far as the ride character is concerned; all the updates on the V6 take place on the upper. A lot is new on the V6’s upper. The exteriors are all mesh, which means that the synthetic toe-bumper and the high-density printing over the midfoot have been removed. The nylon strap over the heel center is also thinner than the V5. These small tweaks help the V6 lose 0.5 ounces over the previous version. At just over 200 grams/7-ounces, the 1400V6 is lightweight by any yardstick. Instead of engineered mesh, the V6 switches to a standard textile with a secondary layer sandwiched between the outer upper and the lining. These underlays serve both as an aesthetic and functional element. They add cosmetic depth to the upper while performing as a support structure. 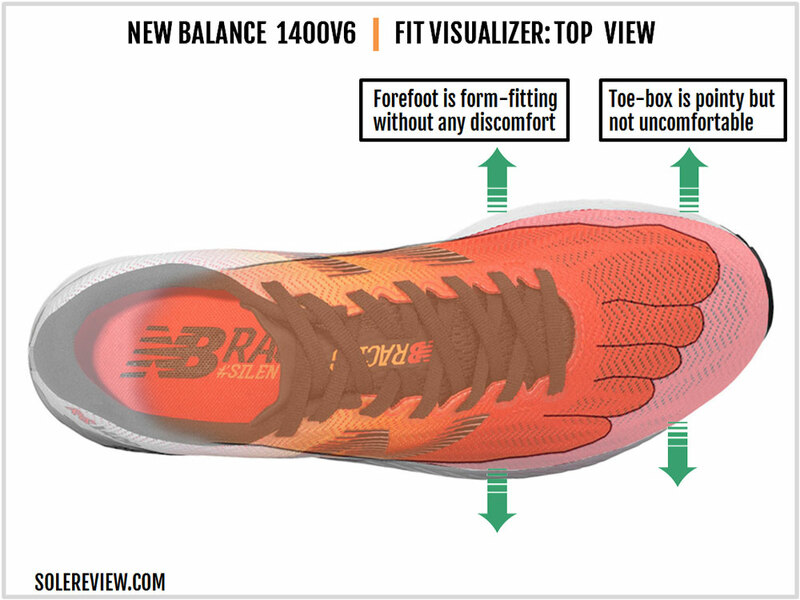 As seen before in other models, the internal overlay design is an old trick in New Balance’s playbook. The underlays do not restrict airflow, and as a result, the 1400V6 has satisfactory ventilation levels. The lacing eyestay maintains the laminated reinforcement which prevents tearing of the eyelet holes. We like what New Balance does here; unlike some brands, the flat laces pass through horizontal slits instead of round eyelets. This was true for the 1400V5 as well. Getting rid of the external toe-bumper helps increase the vertical toe-box room. The V6 also has a bit more space in the front which is a result of both the new toe-box design and the thinner heel strap. Using a lighter material over the heel allows the V6’s collar to assume a relatively relaxed stance than the V5. While the V6 fits true to size, these two factors help open up the fit by a small margin. The 1400 is still a very snug-fitting shoe, so when we use terms such as ‘relaxed,’ it is only in reference to the outgoing 1400V5. Unfortunately, you’ll have to live with the single-width which the 1400 comes in. There are no additional widths. A snug fit is great for a shoe in this category. 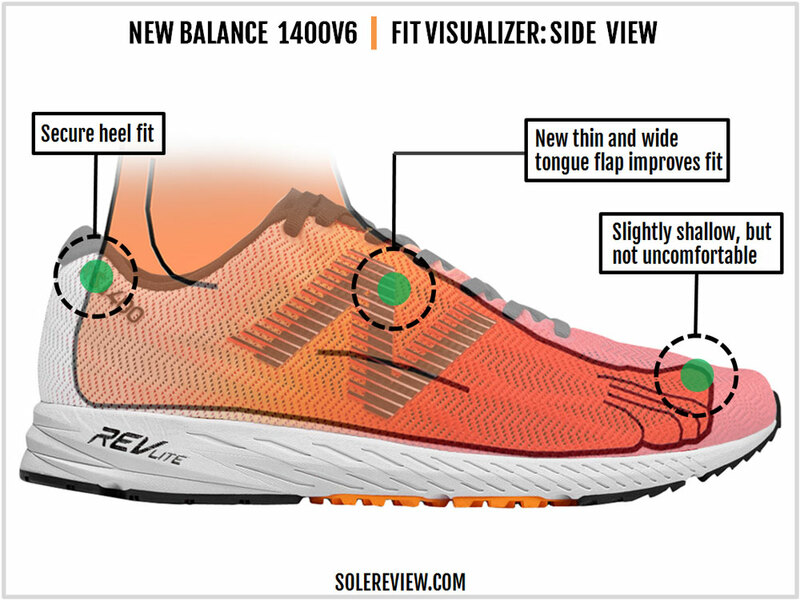 The 1400 isn’t a daily trainer but a race-day or speed-training shoe, so a secure fit greatly assists in foot lock-down. The rear uses an internal counter along with adequate padding, so it prevents the heel from moving around. So far, all the changes we’ve covered are the minor ones. The tongue goes through a significant reset; 1400 swaps the padded and conventional design for a flatter, racing flat kind. The new tongue has a very wide flap with thin edges which fill the void between the outer upper and the foot. The thin wrap also adds to the midfoot fit character, making the tongue blend in as an integral part of the upper rather than a separate component. This update brings the 1400’s tongue fit and feel at par with models like the Saucony A8 or the Nike Zoom Streak. The draping effect of the new tongue helps make the midfoot fit smoother and feels great right out of the box. The amount of lamination used to cover the eyelets has decreased as compared to the V5. The entire eyestay is softer, and this change is particularly noticeable near the last two eyelets. This area is more pliable than the V5 and requires zero break-in time. Over the years, the general consensus is that the compression-molded Revlite is fairly durable. It doesn’t pancake flat in the early stages, and besides, the midsole is fairly firm to begin with. That said, the heel cavity area will bed-in sooner than the rest of the midsole – similar to what happens to Mizunos. The outsole has a generous application of rubber which will go through its eventual wear stage. 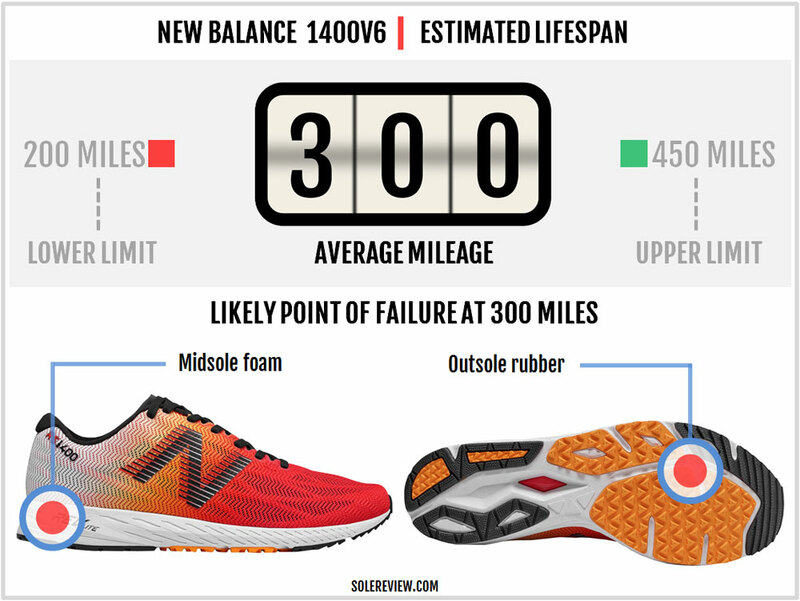 Expect around 300 miles out of the New Balance 1400V6. In the broad scheme of things, the 1400 gets very little wrong. 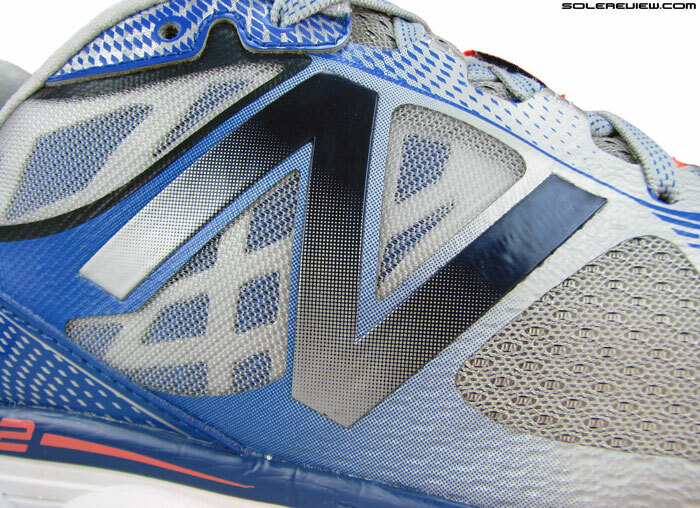 Okay, the lack of widths sticks out, that too for a New Balance shoe. Also, the 1400 isn’t great for running in low-light conditions due to the lack of reflectivity. But other than that, the 1400 is a display of running shoe excellence. The insides of the single-width upper are smooth and hold the foot securely in place during speed runs. The 10mm drop midsole makes the shoe versatile, and the cushioning is just right for medium-distance runs. The single-density midsole makes the transitions smooth, and the rubber outsole has an excellent grip over the road and synthetic tracks. The new tongue is a welcome update to the 1400’s fit. 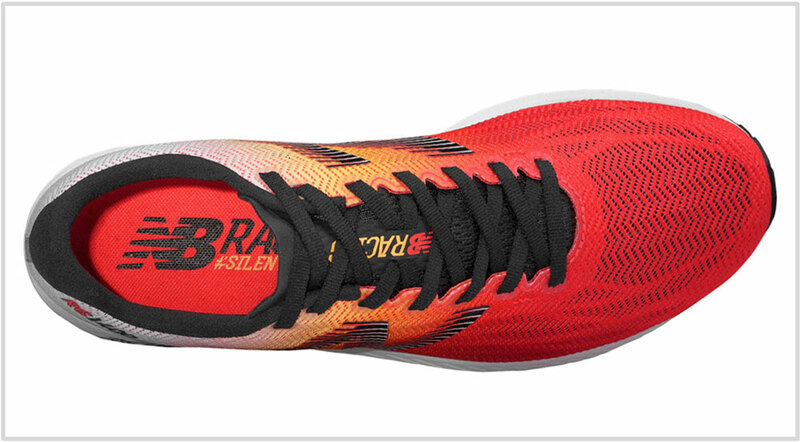 The racing flat tongue wraps the top and the sides of the foot to result in a confidence inspiring midfoot grip. All of this is presented in a 7.2-ounce package which retails for $100. It’s hard to nitpick that. 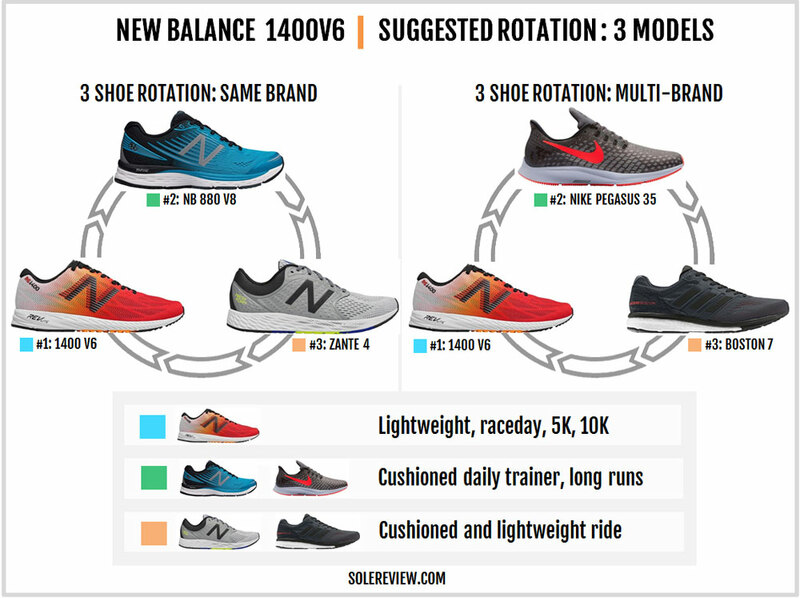 The 1400 is a lightweight racer so rotate it with (relatively) heavier trainers for a diverse use-cases. 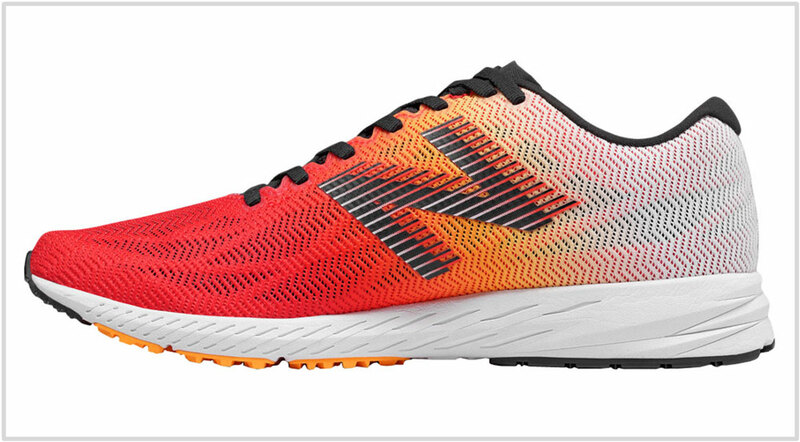 The Zante V4 has a higher level of speed-friendly cushioning which works for longer distances – say running a half marathon without the excessive softness. From adidas, the Boston 7 does the same thing but in a different way. The Boost midsole is more responsive with a longer foam and outsole life. The Nike Pegasus 35 and the New Balance 880V8 are good daily trainers with plenty of cushioning. A few readers mentioned the New Balance Beacon as a suitable rotational companion. But since we haven’t reviewed the shoe, we’ll keep it out – for now. The adidas adizero adios 3 is also an excellent road racer, except that it’s significantly more expensive than the 1400. For the higher price, you get increased midsole and outsole durability over the 1400 due to the Continental rubber and Boost foam configuration. The upper is a no-frills mesh and suede upper but without the smooth fit of the 1400. The Nike duo of the Streak 6 and the LT4 are great alternatives to the 1400 with a different ride and fit character. The Zoom Air bag adds snap to the midsole, and both the Streaks fit tighter than the 1400. As the Streak LT4 is the more minimal of the two, the Streak 6 is more comparable to the 1400V6. On the list, the Saucony Type A8 is the NB 1400’s closest competitor. The levels of cushioning are similar, both shoes use a racing flat tongue, and the outsoles have a superior grip over all surfaces. They’re also evenly price-matched. If you like Wave-based midsoles, then the Mizuno Shadow is for you. The ride is firm with padding levels optimal for runs up to a 10K. Within Asics, your choice is limited (unless you call Japan or South-East Asia home) to the Lyteracer TS 7. It’s a good racing shoe for up to a half-marathon, with a comfortable upper fit and excellent outsole traction.